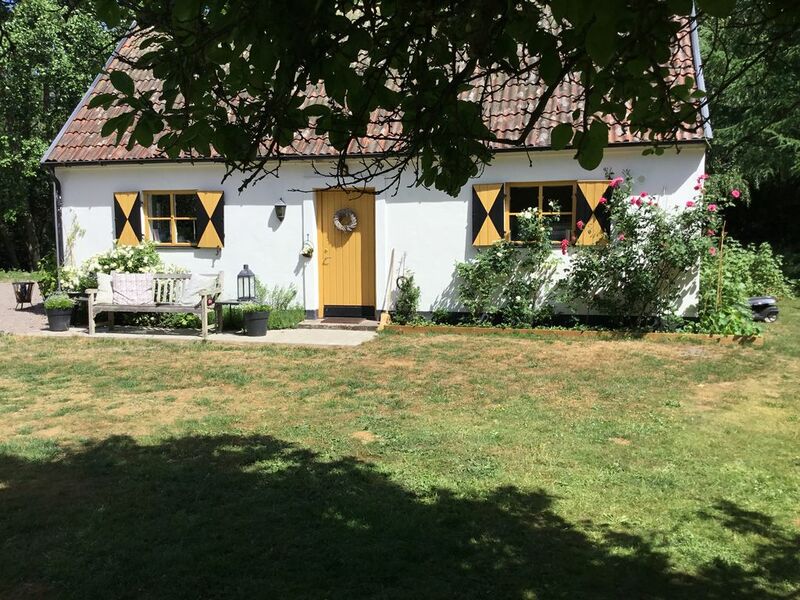 Looking for a warm and welcoming place to rent in southern sweden? Look no further! This housing is situated by a blooming forest next to a medieval castle. A very charming accommodation with one larger room, fitted with a king size bed, which we easily convert to two single beds if you find that more "comfy", dining table, wifi and tv and a smaller room with a bunk bed. The cottage, which is a part of a larger house where we live with our two dogs, also has a kitchenette with two cooking plates, fridge and a bathroom with a shower. Du har også adgang til en fin udendørs terrasse med gasvarme og grill i haven. Du kan holde på eller gå til de flotte vandreruter i skogen og langs havet. The castle and its wonderful garden will show special days throughout the summer by its owner. Også i nærheten av mange flotte golfbaner og alle de seværdigheder som nordlige Skåne kan tilby! Parking space is available for cars but not for caravans. The fee is € 120 / night during the off-season for the king size bed and an additional € 20 / extra bed. High season € 150 / night and an additional € 20 / extra bed. We serve a big healthy breakfast / brunch buffet on the patio if the weather permits. If the weather is bad, it is served in the main house. Cost 15 € / person. We also serve a smaller breakfast cost 10 € / person, notify us in advance if you want breakfast. Upon request I can prepare lunch packages for your hikes and excursions at an additional cost. Beautiful and healthy dinners can also be served upon request. Please give me 2 days notice for planning and preparation of these meals! We are pleased to serve you breakfast buffet in the garden if the whether permits, otherwise in the main building or if you prefer a tray in your house. Only the nicest things to say about this Cottage along with the sweetest owner and caretaker!!! Mia took no shortcuts in the beautiful furnishings in this cottage, as nice as you would expect in a 5 star hotel. Every inch was decorated with amazing class and beauty. Mia is the most amazing owner-caretaker that I have ever come across in my 15 years experience renting properties on VRBO-Homeaway. Every single day she met us with a smile and asked what she could do to make our day easier. Mia would offer us a ride every single day in her car to take us places, at a fraction of the cost of a taxi ride. Such a wonderful sweet young lady, with so much class. Such a beautiful location in the woods, so very quiet and peaceful. 20 minute drive to the coastal beach. *** A 5 minute walk to the beautiful Castle, and endless hiking trails through the woods. My wife and I WILL BE BACK! Thank you soooo much for all those wonderful words and I can only answer the same to you! You are such a wonderful couple, and you helped me with my dogs Gaja and Bella when I was ill in the flue, witch I can’t say how much I apriciated and the dogs, they just love you! It felt that I had known you all life, so positive easy to communicate with and so caring. You are the best ever! My dogs and I miss you a lot , Gaja and Bella were waiting for you outside your door and were so disappointed when you didn’t show up to play with them or take them for a long walk. The dogs and I really hope you will come back and we will see you soon again! Ni är så välkomna tillbaka alla tre<3! Det var så trevligt att göra er bekantskap och skönt att Geisyr hade en lugn nyårsafton med inte alltför mycket oväsen. Tack för att ni lämnade stugan i så fint skick trots att ni betalade för städningen. Hoppas ni får ett fortsatt fint 2019. Tack för att ni valde Mia’s Cottage för er lilla ”minisemester” i Vegeholm. Det var så trevligt att lära känna er alla och tack för de givande samtalen vi hade under frukostar och middag i min matsal. We stayed at Maria's little guest cottage for a weekend away from the city. It's a very pittoresque house with a cosy, warm interior. Maria was a great host, with sparkling wine and snacks ready for us at check-in time. Perfect after a few hours in the car. We decided to stay in the first night, and cook a meal in the cottage. It is possible to cook here, but only the basics because there is only a kitchenette. So no bigger meals are possible. We appreciated the fridge, so that we could stock up on drinks and snacks. It is always a good thing when traveling. A pleasant surprise was the great surroundings, a lush forest with big trees and a castle just around the corner. Perfect for hiking and wildlife watching. Maria has a couple of dogs, and they are curious, but well trained. Although, you should probably not be afraid of dogs if you decide to stay here, because they sometimes run around in the garden. We came when the weather turned a bit colder, so we needed to have the heater on. The heater was a little bit noisy during night time, but it was possible to turn it off, so it wasn't a big problem for us. Thank you for choosing my cottage for your weekend getaway. It was a pleasure meeting you and thanks for leaving the cottage in mint condition when you left. Your always very welcome back. Fin bolig og dejlig morgenmad! Tack Dorte med familj för att ni valde Mia’s Cottage för er vistelse i Ängelholm. Det var så trevligt att träffa er alla och ni är varmt välkomna tillbaka om ni har vägarna förbi. Mysig stuga o vacker sevärd omgivning. Stor gästfrihet och vänligt bemötande från en engagerad hyresvärd som även tipsade om fina utflyktsmål. Trevlig stuga som var sval i denna sommarens hetta. Hundvänligt med stor tomt för hundarna att vistas på. Närhet till skog för promenader och bad vid härlig lång sandstrand för både människor o hundar. Tack Eva, Mia och fina hundar för ert besök i Mia’s Cottage. Det var så trevligt att ha er här och att ni uppskattade både boendet och omgivningarna här i vackra Skåne. Ni är hjärtligt välkomna tillbaka ! Om en halv time fra ejendommen finder du flere berømte golfbaner, gode sporingsområder og andre gode ting at opdage i omgivelserne. On the 4 bikes that are included in the rent it takes about 10 mins biking to the beautiful beach of Skälderviken. Mia's Cottage is also a great place for dogs with its large garden that is fenced and with the beautiful forest just outside the door. A dog yard is also available if you want to discover things without your dogs. The closeness to Kullaberg on the peninsula of Kullahalvön and Hovshallar on the peninsula of Bjärehalvön and their spectacular tracking possibilities is very appreciated and so are the walks in the forest just outside the cottage.